This glass Nativity was made by a small family-run workshop in Myanmar (Burma). Each piece was blown from recycled glass, made individually by hand. The family uses basic tools and works from a shed next to their home as their workshop. The artisan family members are not Christians. 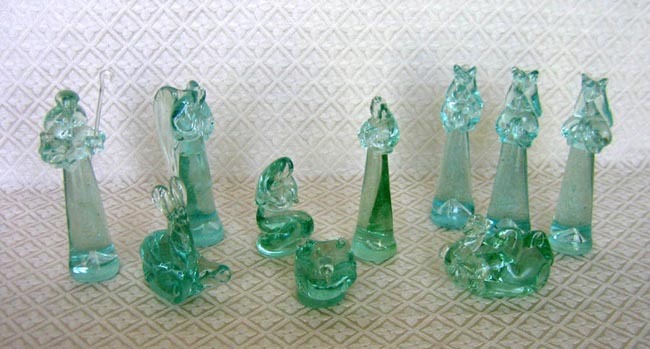 Years ago someone from a local Christian sect asked them to make a Nativity out of glass and told them which figures composed the set. Since then, purchasers have referred their friends to the artisan family to make additional sets. The set has 11 pieces: Joseph and Mary with praying hands, Baby Jesus, manger, an angel with long wings, a shepherd with delicate removable staff, a donkey with very tall ears, three wise men, and one camel. The wise men and shepherd measure 5.5 inches tall.